Don’t you love when something new comes to town especially when it is food related? I know I sure do, I am always excited to try it. truLOCAL, Connecting You to the Source is a great way to not only eat locally but it frees your time going to the grocery store with easy online ordering and delivery right to your door! 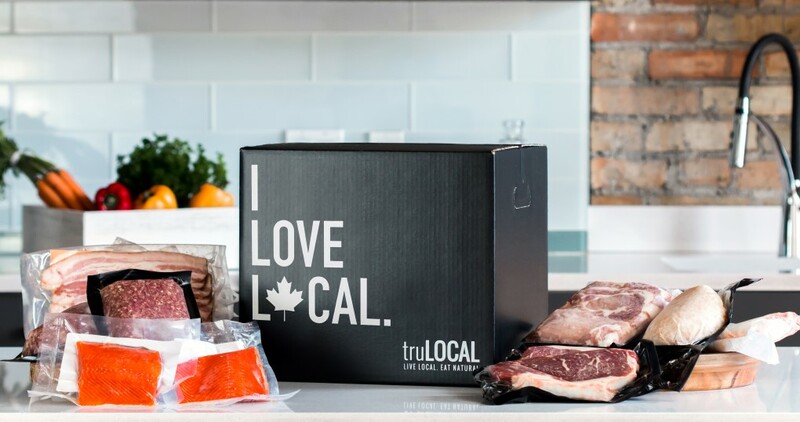 truLOCAL is like having your own private butcher delivery service. You set up the delivery at a 2 week, 3 week, monthly or 6 week interval. If you’d like a more customized frequency, you can always use their “Reschedule/Skip My Next Box” feature to choose your billing/shipping dates! Cancel at anytime, no obligations at all. Going on a trip and need some extra time then just easily skip a delivery. They ship Mondays, Tuesdays and Wednesdays with standard overnight shipping to arrive to you in 1-2 business days. Our box was delivered promptly even though the weather was bad and that I had ordered on a holiday too. Choose from a variety of their locally sourced products including mouth-watering 100% grass fed steaks, ground beef and bone broth, delicious air chilled chicken or wild caught sockeye salmon. There is also many other kinds of fish, lamb, sausages, pork and more. All sourced as locally as possible. truLOCAL is a Canadian company supplying Alberta, British Columbia and Ontario. Sit back and relax and enjoy the best quality meats while delivery comes right to your door. Sometimes local farmers only sell at farmers markets which may not be convenient for you to source weekly. So with truLOCAL the best products your province has to offer are available right at your fingertips. Not home to accept your order? 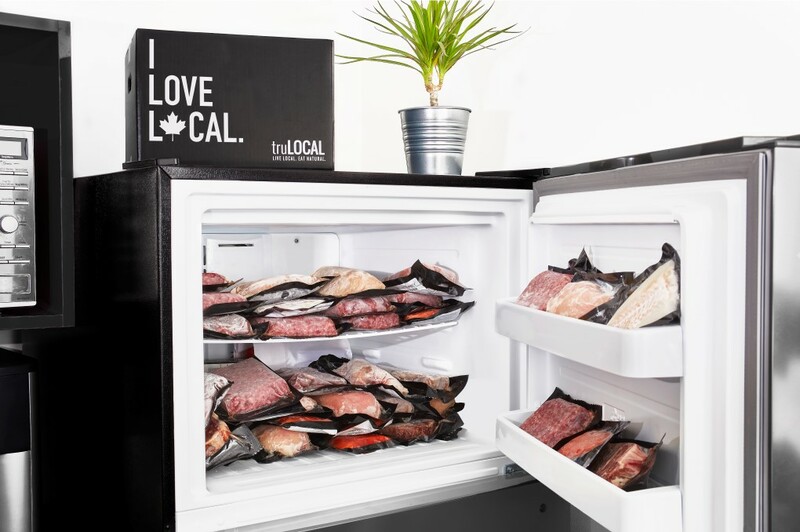 Not a problem, truLOCAL has your order in refrigerated coolers so that your products will stay frozen until you get home. You can have your box delivered right to your house, apartment, office or gym! truLOCAL brings your local farmers right to your door where they might be harder to access in your local grocery stores. When you have a freezer full of proteins life is so much simpler. Dinner is just a reach away. Going to the grocery store for fresh produce and staples is all you need. truLOCAL have a great selection of meats, fish and more. You can build a small box for 1 person with up to 18 individual portions or go for a bigger box that feeds 2 or more people with up to 40 individual portions. I love that this company bridges the gap between the small farmer or local producer and the consumer. This helps the small farmer connect to a wider consumer base. Buying local is where it is at!! We are all understanding the importance of this now. With less of an environmental impact, helping to create a good local economy and community and it all tastes better as it has less time in transit and is fresher. Try truLOCAL today, it is easy, efficient and affordable. Follow them also on Facebook, Pinterest, Instagram, YouTube and Twitter. I LOVE the idea of being able to get locally sourced food. Down here in Georgia, we all have gardens, so locally sourced is in our blood. truLOCAL sounds like a great service. The idea of locally sourced foods is an excellent way to support the community. The idea of TruLocal sounds wonderful. I like that they deliver right to your home and that they are only grass fed. Sounds like a great service to utilize. This is for sure a very convenient service. And I love the idea to have a devilery at a 2 week. I don’t know that fish by us is very fresh so it definitely keeps me from buying it at the store. It often doesn’t smell good. Buying from your local sources is a powerful way to live these days. It is support to our local businesses and the most fresh foods delivered. Yum. This is great! I like how they are helping local farmers with their businesses. I will check this out. Being able to have local foods is so important to us. I love that TruLocal has such a great delivery system! I personally HATE shopping for meats. We buy local as often as we can. It is a great way to support our farmers and we can be sure that we get only the freshest. I will give turLocal a try. It makes me happy that they provide the convenience of having fresh meat and fish delivered to my home.